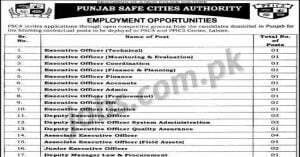 Find latest Executive Jobs in Pakistan by various national, multinational and government organization. Executive jobs are professional and management level jobs by great salary and perks. Here you can search for top managerial jobs including companies presidents, chief executive officers, chief financial officers and other great career opportunities. Use the search filter below to search for Executive jobs by qualification, skills, education or job title in major Pakistani cities.